India chief coach Anil Kumble defended his team after the hosts were bowled out for 105 in their first innings, resulting in Australia taking a commanding lead of 298 runs at stumps on the second day of the opening cricket Test here on Friday.In response to Australia's 260 in the first innings, India were bowled out for a paltry 105 as left-arm spinner Steve O'Keefe took his career-best six-wicket haul. For India, Lokesh Rahul was the top-scorer with 64.But India's bad performance end there as they dropped Steven Smith (59 not out) thrice as the Australians reached 143/4 in their second innings and take a 298-run lead which makes it much more difficult for Kumble's men to come back. "You are bound to have one bad day. It was disappointing as we were at a decent position when (Lokesh) Rahul and Ajinkya and were batting well, then we lost four wickets in five or six balls which certainly pushed us back. There were some soft dismissals. 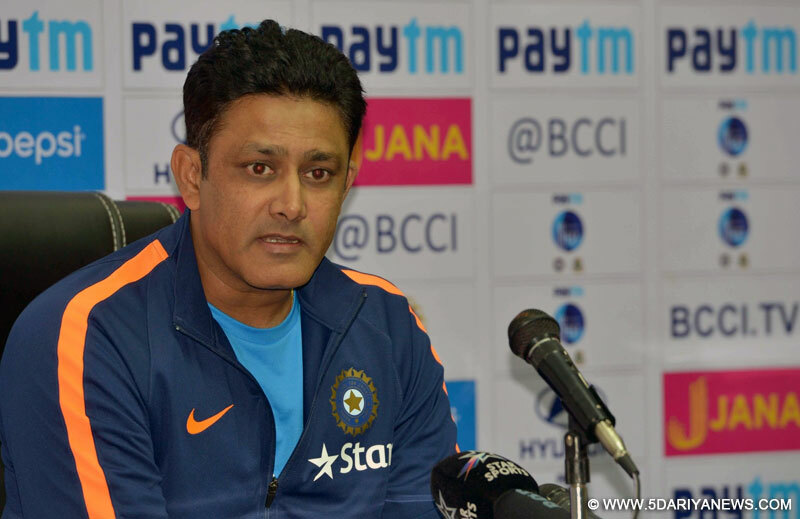 It was unfortunate that we lost wickets after Rahul got out," Kumble said after the game. The former captain, neither blamed his batters nor the wicket on which batting is getting difficult session by session. "This wicket was challenging and so and it needed a lot of restrain. You need to put your head down, you can score runs on this surface. It's a surface need to adapt. We didn't adapt that really well. Probably if you look at yesterday, the first 80 runs in the first session and the last 60 runs for the last wicket -- that slightly took us away from what we were wanting to restrict Australia to," the legendary leg-spinner assessed. "Our batsmen have been scoring exceptionally well. Virat (Kohli) got out today and Pujara got out today, as did (Murali) Vijay. It was a poor day. Lot of cricket left in the Test match. Tomorrow is another day. "On this surface, you need to play your shots. Lower-order has contributed well for us so far and today that didn't happen. It requires aggression and caution as well. You need to mix it up." He even though didn't admit the team lacked the intensity to succeed on the day, he did admit that dropping catches has hurt them badly. Smith was dropped thrice on 23, 29 and 37. "We dropped few catches which has hurt us. You need to hold on to your chance and even half chances. In this game, we dropped Smith couple of times and that pushed us back," he felt. "Tomorrow, we need to take few early wickets and put the pressure back on Australia. "Kumble also said that opening batsman Rahul, who hurt his right shoulder while batting, should be fit for Saturday. "He's hurt a shoulder little bit. We had to take some care, a small precaution. He should be okay tomorrow. These injuries generally take 24 hours and he is okay," he said.